The big question for me last issue was 'Where's Krypto?' Having accompanied Lois, Jon and Clark to the Fortress of Solitude in the previous chapter of Revenge, he was neither seen nor addressed. It had to be a story point, right? Wrong. 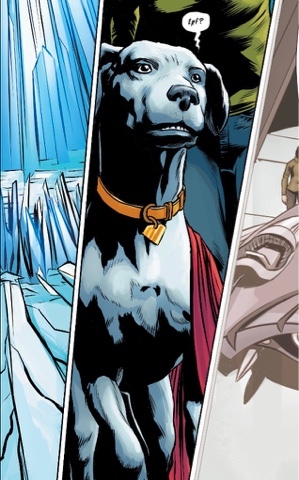 As this issue opens, Krypto is by Lois' side, and has apparently never strayed. Obviously, the Dog of Steel was simply off-panel last issue, just to the right, or left, maybe above, perhaps below, the panel borders. A more present Krypto plays a big part in this issue, which begins with a worried Lois wondering where Jon has got to. Last month, mother and son had apparently been vaporised by escaped Kryptonian criminal Zod as they fled for their lives in a tiny spaceship. It turns out that they were never in there, they let the ship act as a decoy while their secreted themselves among Superman's trophies. 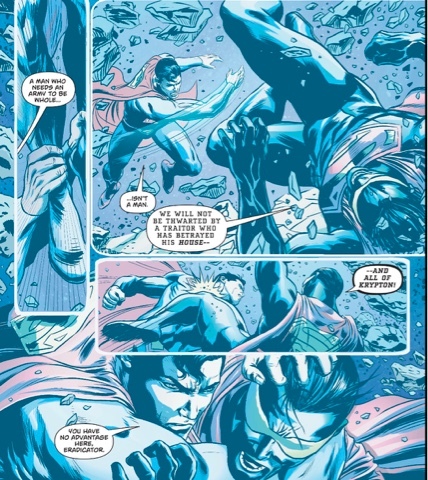 Superman, meanwhile, has been projected into the Phantom Zone with other members of his support team, along with Zod cronies Cyborg Superman and the Eradicator. The Supers have been banished, but the bad guys have a mission. The good news is that the conduit between Earth and Zone has restored the eyesight Superman recently lost. The bad news is that the all-star Super Squad is stuck in the Zone with no way to get themselves home. They can, though, face Zod's sub-team, try to stop them enacting his supposed plan to release an army of evil Kryptonians on Earth. Speaking of Earth, Zod's having trouble with some of his troops. But can Jon, aided by the mysterious voice, save the day? And what's the true nature of Zod's army? Answers are provided as writer Dan Jurgens and artist Patch Zircher wrap up this multi-parter with panache, if not the tightest of bows. There are a lot of people in this book, and while they don't all get a moment, Jurgens places the focus where it should be, on Clark, Lois, Jon, Kara and Zod. The bickering between the villains is entertaining, and logical, while Lois and Jon demonstrate guts, Supergirl is awesome and Superman the inspiring hero I love. Zircher's compositions are packed with power and finished with real craft. 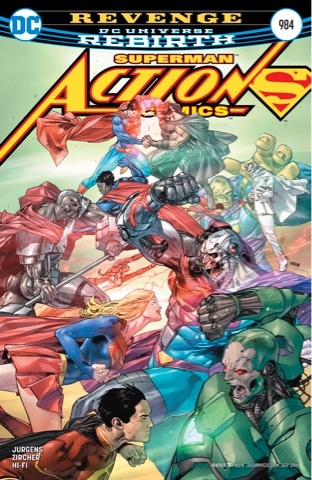 The storytelling is strong throughout, with standout moments including the, er, rise of Mongul, and the revelation of Zod's true desire. Never mind the Houses of El and Zod, the House of Hi-Fi does an especially fine job on colours this time. In the Silver and Bronze Age, Phantom Zone scenes were uniformly grey toned, while modern depictions - such as the latest Supergirl - go full colour, taking away the eeriness of the place. Here, though, it's a clever combination of the two approaches - blue hues for the environment, with character colour dialled right back. 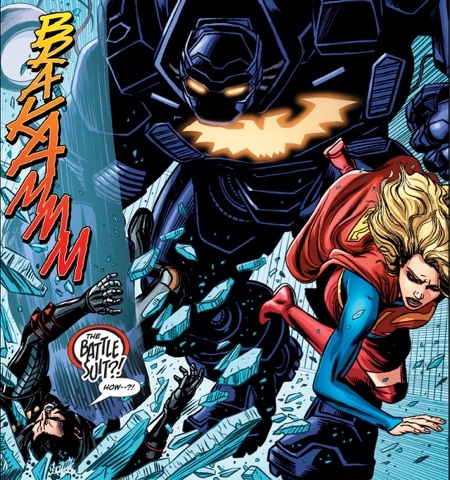 The peak of this approach comes as Superman whacks the Eradicator - just look at the solid blocks of blue adding an eerie depth to proceedings. It really feels like a ghost world, and once we snap back to reality, the full-on colour is like a slap to the face. But a pleasant one. Rob Leigh remains the secret weapon of the Superman line, giving everyone fantastic fonts that suggest their mode of speech, or character - the LL narration boxes for Lois, for instance, are charming. He never chooses quirky letterforms for the sake of it, his work meshing elegantly with the art. You want a memorable cover? 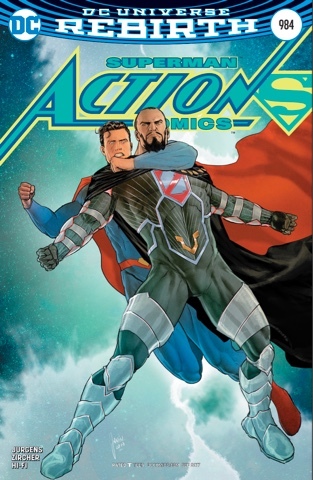 This comic has two, the battle scene by illustrator Clay Man and colourist Tomeu Morey, and the Zod variant from Mikel Janín - both gorgeous. There are loose ends a-dangling at the close of this issue, but Superman's is a never-ending battle. We rejoin it in just two weeks and you know what? I feel thoroughly spoilt. A very soft finish after a promising premise. A big takedown of the villains by the heroes would have been really satisfying; I suppose DC are wanting to eke out the drama. I did enjoy it enormously, though. The look of the Zone is eerie as you say. I don't understand the physics of it. Supes says they are intangible but then the fight. 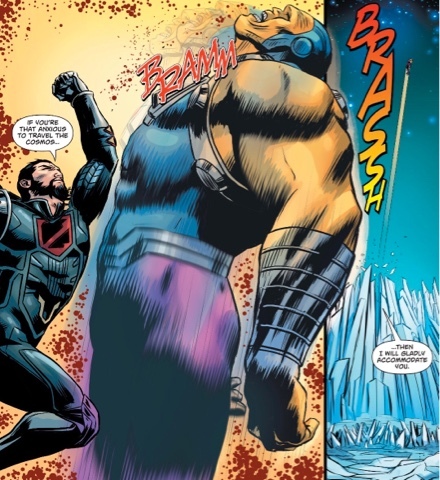 He says the Eradicator has no energy powers but pages before he blasts someone. Ah yes, that voice, it comes from behind a curtain!